Moving adventures– yeah, it was pretty touching. So my family and I recently moved into a new house. And that’s when I realized something: moving is an awesome family bonding experience. My dad insists on doing the move ourselves instead of hiring movers. I was alright with the plan until I realized that “ourselves” meant him and I, because really, my sister can barely lift her own backpack and my mom is the kind that would want to help, but is usually told to sit down two minutes later. We started off in the afternoon, and went into the night. And by night, I mean 5:00 AM. My dad and I would load and unload the rented U-haul truck, and then my mom and sister were assigned to cleaning up the house itself. There was a lot of “HEY! OPEN THE DOOR! THIS IS REALLY REALLY HEAVY.” and other frustrated complaints. But then you get to around 2 in the morning, and you’re ridiculously grateful when your sister or mom grabs a heavy box from you to lend a hand. And then the family sits down for food at 3AM, consisting of a bag of bacon, microwaved corn and spring onion pancakes. I haven’t seen my parents eat bacon in years, so watching my dad gobble up a bowl was eye opening. Now, my family isn’t the closest of families. I mean, yeah, we eat together, we watch TV together sometimes, but when it comes to getting out of the house and actually doing something together, that’s rare. And the move forced us to physically work with one another, and it was sort of beautiful to see. We really were pushed to our limits, and ached for days afterwards. But we did it. 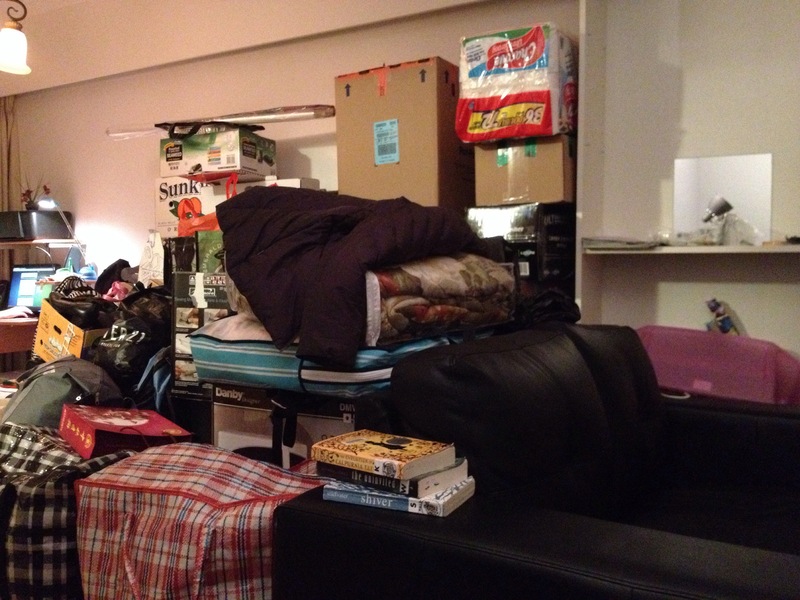 A portion of the living room turned into a temporary storage area. It’s been a little more than a month since we’ve moved, but there’s been a lot of improvising. I’m taking the basement, which needs a complete renovation, and my parents told me to take their room for now. Which means they moved their bed to the living room. It’s actually amazing having a bed in the living room, and more often than not, I end up watching TV on the bed instead of the couches. Since I’ll be getting the basement mostly to myself, I also get to decide on how I want to decorate my living room! I’m thinking of making it into a woman cave, but I’m still trying to get ideas on how I want it to look. But I get a blank canvas to work with and I can’t wait! So if you’re looking for a good bonding experience, I’d suggest moving. But then again, it could have gone the other way and ended in disaster. So maybe everyone should stick to laser tagging. Not the closest of families sounds like a typical Chinese family. And that living room looks so Chinese..hahaha. Weird you should say that as we had a room that looked permanently like that in our house when I was a child. Not the living room, I hasten to add. This is hilarious! XD We look at the picture and we know it’s most likely an Asian household! Ya hahaha… it’s usually a room full of too much stuff cause it was on sale. My mum loves bulk buys of toilet roll in the sale. Also boxes of cereal. That red and white bag is so Chinese..lol. Should be interesting living in a new area. Thumbs up for change. I think that was quite adventurous of your family to suggest a move like that. My family would *never* do that precisely because it would mean we had to work together! My family don’t like putting themselves in a vulnerable position ie where anything could go wrong and not to plan, as they are very cautious. If anything goes wrong, they will be like “why didn’t you do it this way”? which is well intended cos they only want the best for us all, but not how everyone lives their lives. WELL DONE! for successfully completing the move. Yeah, there were many times during the move when I was worried things would go wrong. I mean, I was sure someone would break a back. And that would’ve been hours of arguing over a hospital bed. But turns out no one did. Sure, there were a few wrists that were pulled, but otherwise, we seemed to have done pretty well!